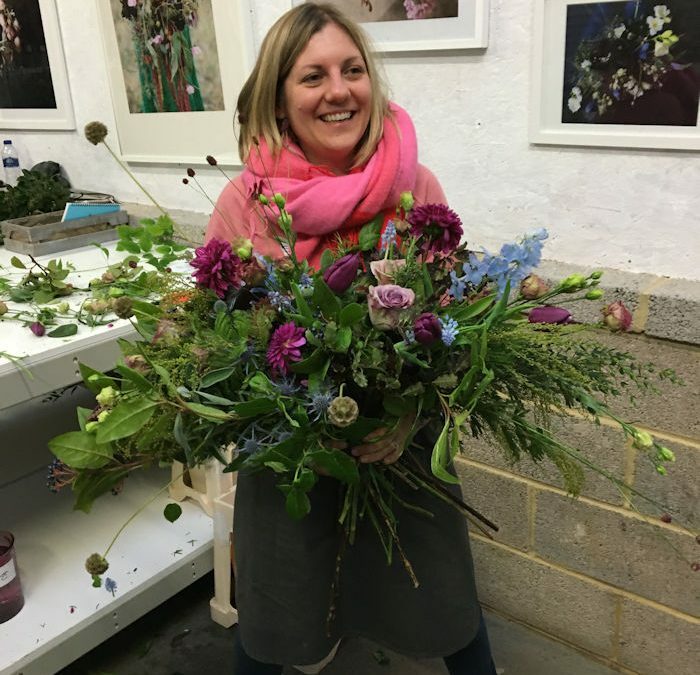 We all have people we look up to – so imagine my excitement as I booked myself onto an intensive Bridal and Wedding Flowers course at Jay Archer Floral Design’s Flower School in October. It was a bit of a juggle, and various family members were drafted in to keep our cottage running and children occupied while I was away. I first spotted Jay Archer via an Instagram blog post by the amazing Flowerona, a go-to inspirational blogger for most florists and inventor of the fantastic hashtag #underthefloralspell. You may have even seen her on Channel 4’s fascinating documentary called The Biillion Pound Flower Market. The two-day course was open, honest and refreshing. There were some fantastic fellow flower lovers on the course, including growers, florists, and enthusiasts. I love learning new skills, so I can bring the best to my clients. I learnt how to create asymmetrical large bridal bouquets, all foliage showers and discovered new ways to present grooms party flowers and floral crowns. We were lucky enough to see Ria Mishaal working as she professionally photographed our work. The asymmetrical bouquet was a real learning curve and pretty tricky to create! The quantity and quality of flowers we used were extraordinary as you can see. Amongst the many things I admire about Jay Archer is not only her quest to use British Flowers wherever possible but also her intent to create clever flowers that look, feel and smell beautiful giving her clients the very best she can offer. My take home message from my two days of flower heaven was ‘to grow we must share’ and I wholeheartedly agree and will adopt this ethos for my business as I grow. Thank you Jay for such an inspiring two days and I look forward to sharing what I’ve learnt in my future work. If you’d like to chat flowers or meet for coffee or join me at a workshop at Eliza Rose Shop I’d love to hear from you. You can find me on facebook or see my flower diary on Instagram.